How Much Water Do You Use A Day? 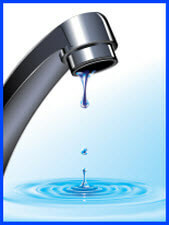 Water usage estimates vary, but most people use between 80-100 gallons of water each day. This may be a surprise but flushing the toilet ranks as the largest use of water in American households, followed by showers and baths. This explains why low flow shower heads and low flush toilets are becoming so popular, and often mandated in new construction. Some property owners prefer to update their older faucets and shower heads to the low flow type to not just conserve water but to lower their water utility bill. Some of these ideas are very simple to implement, other you may want help from your Favorite Plumber. Tip: Taking a shower rather than a bath could save a lot of water over the year. Shower: The older shower heads used about 5 gallons of water per minute. California has the most stringent standard for low flow shower headse in the country with a maximum flow of 1.8 gallons per minute. Tip: Taking a shorter shower with a low flow shower head will save a lot of water. Teeth Brushing: It is common to leave the water turned on when brushing our teeth, but turning the water off until it is needed can save about a gallon per brush, it all adds up over a year! Tip: Installing an aerator on your bathroom sink faucet can save even more water. Dish washing: Newer energy star dishwashers use about 6 gallons of water per wash, older dishwasher used about 16 gallons per wash. Whereas washing dishes by hand can take about 8 to 26 gallons, depending on number of dishes, and the wash and rinse technique used. Tip: Use an new energy star dishwasher saves water and electricity. Or use an efficient hand washing technique with an aerator of the sink faucet. Clothes washer: Newer energy star clothes washers use about25 gallons per wash, older washers use about 40 gallons. Tips: Use a newer energy star rated washer with a load size indicator to save both water and electricity. Tip: A toilet upgrade will save a lot of water. Toilet flushes are normally the largest use of water in a household. Also, check for leaks, or a “running toilet” sound is an indicator of water being wasted. Outdoor watering: Outside watering uses about 2 gallons per minute per faucet. Tip: Sprinklers can be optimized to not overwater lawns or flowers. Sprinkle emitters should be adjusted to avoid over-spraying into non-landscaped areas. Consider reducing total landscape area such as flower beds and lawns that require watering, and how about with drought tolerant plants? With everyone helping to do what they can to conserve water, it will go a long way to help conserve our valuable resources and keep our water bills low. Many of these suggestions are fairly easy to implement. However, your Favorite Plumber is just a phone call away if we can be of any assistance.